I’m back! So is Jay Jay! On Tuesday Connor, Jake, Ian, Lily, and Jay Jay set, today I joined them, and now there are some 44 new problems on The Beach. Enjoy! He taught the lucky participants how to deal with little tricks like toe hooking and bicycling. 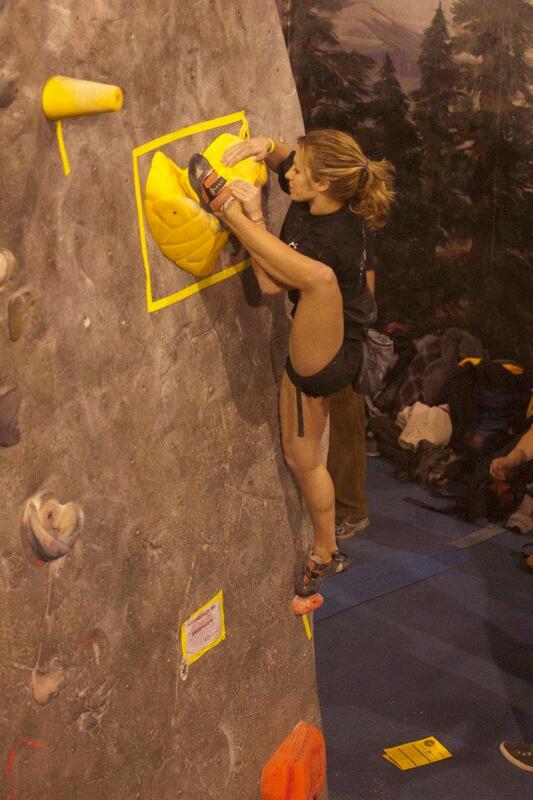 To see more photos of the event check out PCI (Pro Climbers International) on Facebook. Very cool Ian! So that’s all for now. Hope you enjoy the new problems! Quick Setting Update + New Volumes + Summer Jam + World Cups and Sean McColl’s First Bouldering World Cup Win! Quick Setting Update + New Volumes! We stripped the Beach today, first strip over the new floor and so far so good. 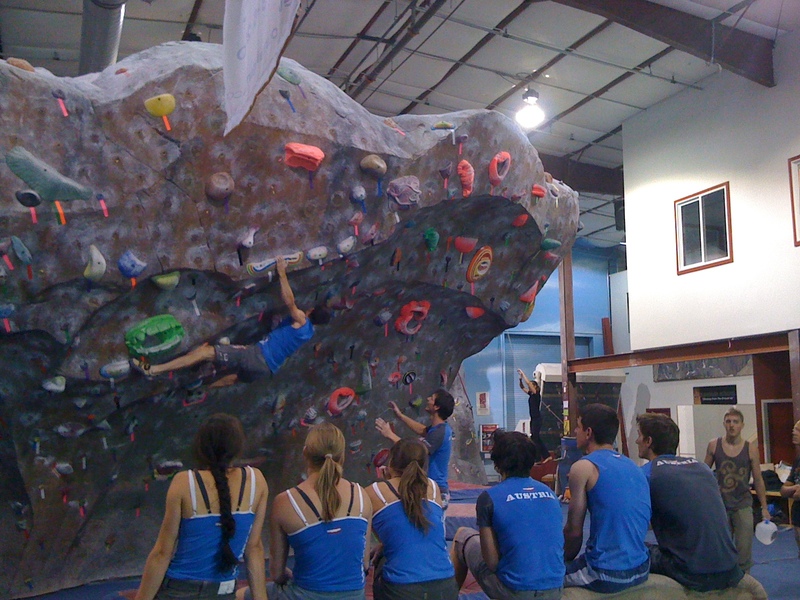 Danny, Ian, Jonny, Connor, Lily, and I set some of the problems with the upcoming North American World Cups in mind–we want to help train Team USA climbers who live here so they’ll be in shape for Canada and Vail, and we also want to give visiting International World Cup circuit climbers some great problems to climb on when they come visit us in the week leading up to Vail. 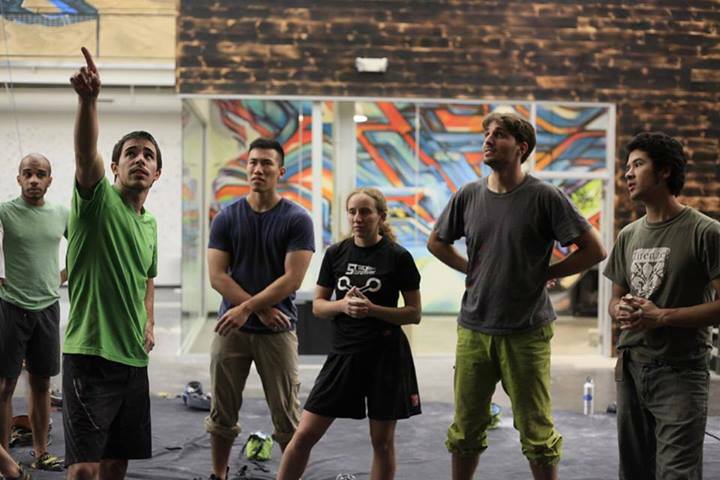 We always enjoy having the WC competitors acclimating at The Spot, and we’re excited to see everyone again this year. In other exciting news (and to help with comp style setting) we just got a shipment of Motivation Volumes in, some with the new World Cup texture. You’ll notice the stickier purple volumes–those are the World Cup texture. The lighter pink volumes have another Motivation texture on them. Check out the new volumes and the new problems on The Beach today (more coming tomorrow) and get a feel for some of the types of holds you’ll see on the wall at the Vail World Cup! The Spot’s annual Welcome to Summer Member Appreciation event–Summer Jam–is happening tomorrow! 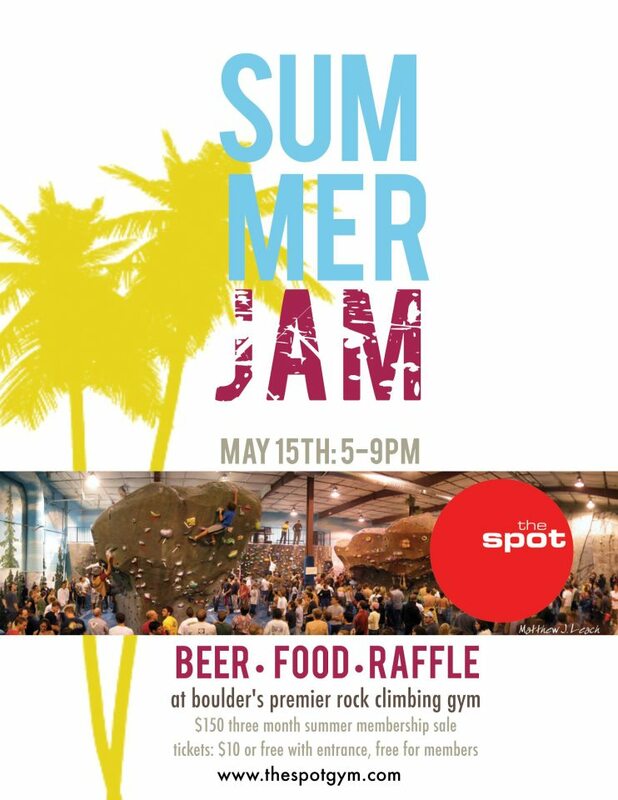 Members get in free ($10 or a climbing daypass for all others) and we’ll be serving up BBQ and Avery beer and giving away a bunch of stuff in a sweet raffle, including a Black Diamond crashpad donated by our friends at MooseJaw. We’re also going to be selling our $150/3 months paid in full Summer Membership. The Summer Membership is a limited time offer, so don’t miss it! 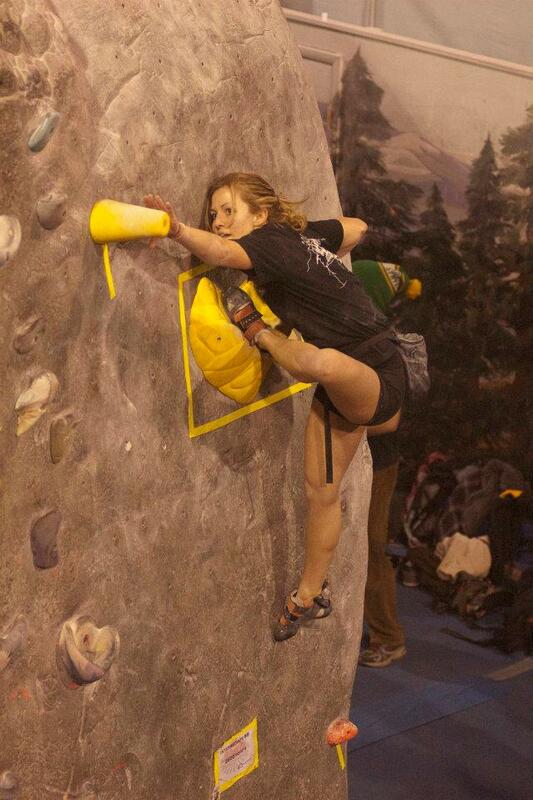 It’s a great deal and a good back-up plan for warming up before going to your projects outside, climbing while holding down a “real job”, or keeping in shape over summer with Colorado’s increasingly unpredictable weather patterns. We’ve got a roof to keep out sun and rain, and we’ve got AC and we’re not afraid to use it. So come on down, bring your family, friends, and roommates to Summer Jam! With the exception of the Vail event there are usually only a couple of competitors in the World Cups from North America. One of the regulars is Canadian Sean McColl. 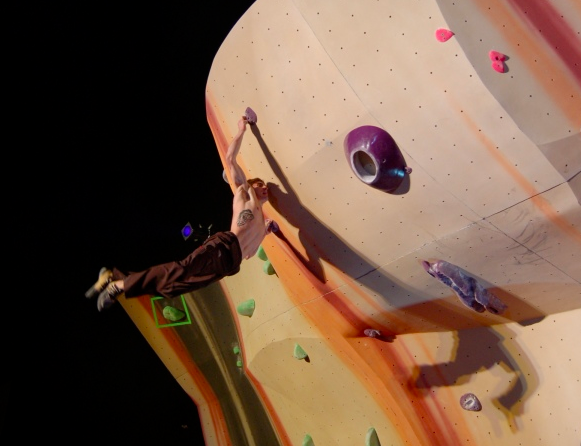 If you’ve watched any IFSC Lead or Bouldering events in the past few years you’ve probably seen Sean compete. 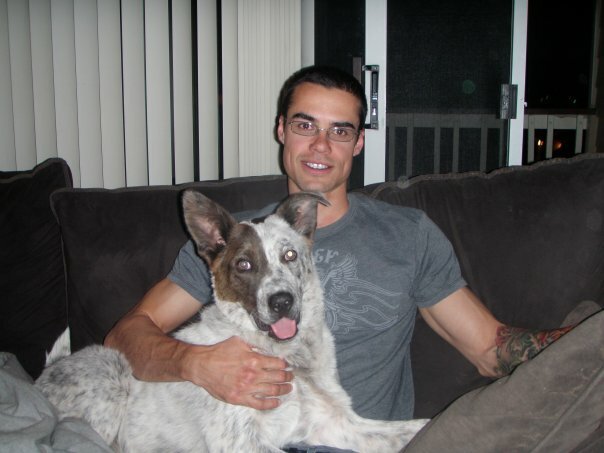 He is a regular on the world podium and runs a well written blog with updates on training and competing. 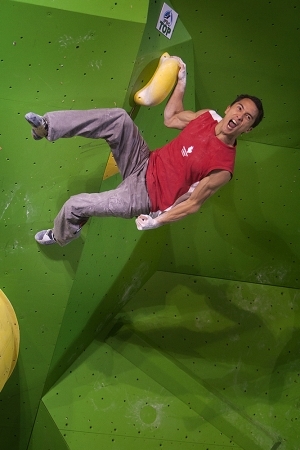 Anyways, Sean is one of the few holding it down from this half of the world, and we are super psyched for him on his first Bouldering World Cup win last weekend in Slovenia. Sean after flashing the last boulder. When he flashed it he knew he’d won. He climbed extremely well in finals. Amazing job Sean! More updates and fresh problems tomorrow. Don’t miss Summer Jam! 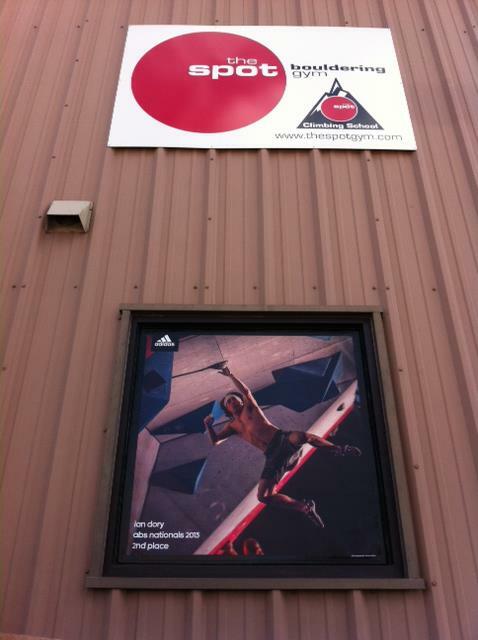 Adidas sent us this sweet poster of Spot Setter and Coach Ian Dory getting 2nd at ABS Nationals. We are so proud of Ian, and so psyched to have him on the side of the building! It was the oldest set, and also we’re getting a new floor under it (see below), so we reset The Beach this week! Setters were me, Danny, Connor, Jay Jay, Jonny, Ian Dory, Chris Schulte, Lily, and Ian Powell. We saved some of the new Teknik and E-Grips to put on this wall, and we also had a bunch of the last set of new holds freshly washed for the new Beach set. 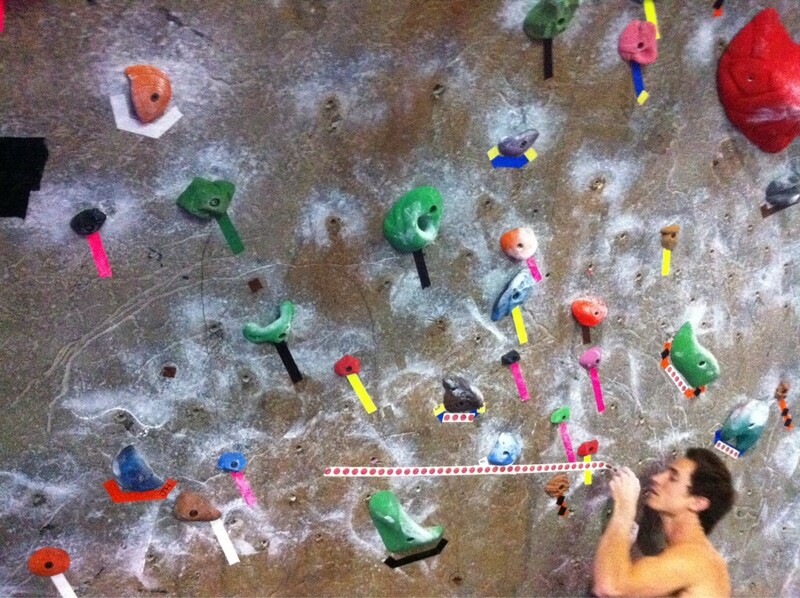 We set 56 new problems from 1 spot to 5+. Over 1/3 of the new set are 3 spot or easier, and over half of the new problems are 4- or easier, so everyone of every ability should find plenty to warm up on and project. Next week we will reset The Font! 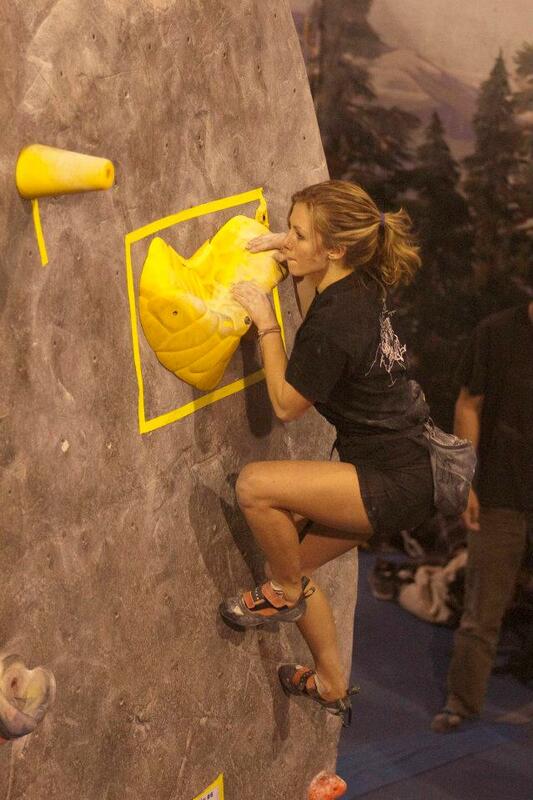 This is happening today, so come down and see the cool art that Spot climbers and staff have created. 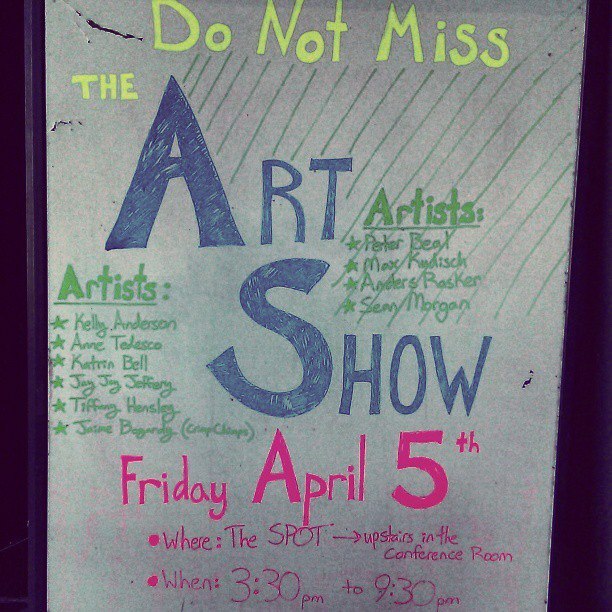 Painting, photography, drawing, wood cutting, jewelry, and more will be on display. Come on down and check it out! The Beach will be closed Saturday and Sunday for the installation, but the rest of The Spot will be open, and Spot members will also be able to climb free at The BRC during the Beach closure this weekend. 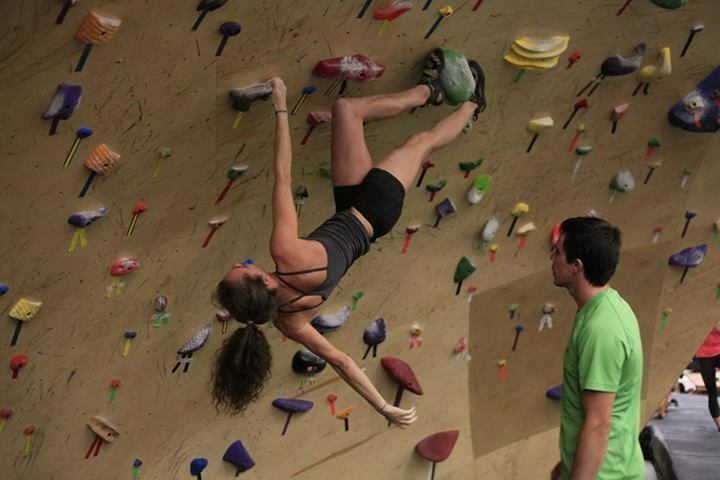 USA Climbing Sport Climbing Series National Championships is taking place this weekend in Boulder. LT11 will be live broadcasting here: LT11.tv Don’t miss it! The top 7 Men and 7 Women from the Adult and Junior sessions of the comp were invited to compete in the Open Finals. The problems were on the Beach, Women’s on the left, Men’s on the right. The Men’s Final was a short powerful climb on the right side of the Beach. The start was a balance move off a sloper, followed by a stand-up/jump to a pinch made of two slopers on a small triangle volume. 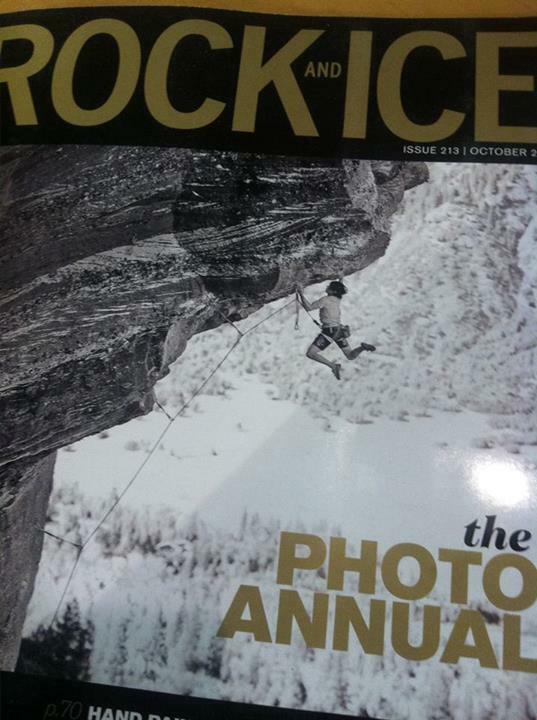 From there climbers moved out right to their choice of a dream pocket and two huge slopers. There was a foot bicycle to help them wrangle the holds until their left hand was in the dream pocket (Final competitor Rob D’Anastasio actually ended up doing a fantastic rose move into the dream pocket!) Next a big move to a wide sloper pinch, a high foot and flag, and another fatty pinch and flat gaston. From there it was a foot switch and high right foot and then a press into a sloper in the slight roof. Just around the corner above the lip was another volume with a sloper and a slopey ball on it. Competitors could either jump out of the press or reach around slowly and then jump to establish on the volume. Either way they took a massive nearly-horizonal swing, then had one more relatively easy move to a finish bucket. The bottom moves gave many of the competitors trouble. Michael O’Rourke flashed through them, but after falling high up he fell several times before sticking the volume pinch again. On his last go he stuck it, then climbed through the problem and nearly finished it, falling on the final volume after swinging way out and coming off. It was a fantastic effort and earned him 3rd place. Matty Hong came out, 2nd place qualifier, and flashed the problem, sticking the horizontal swing as the crowd went absolutely crazy. This put a ton of pressure on 1st place qualifier Rob D’Anastasio, who knew he’d have to flash the problem to win. Rob handled the pressure well though, giving a great effort that involved the rose move at the bottom and sticking the top swing when everyone was sure he was off. I think his body literally went above his hand and somehow he managed not to let go. The crowd went crazy again and Rob maintained his first place. Full preliminary results will be up soon at http://www.thespotgym.com. No pictures yet, will post some when we get ’em. Thanks for coming out, and nice job everyone! So in the last week we’ve reset the River, Dojo, Hueco, and today the Beach. Tomorrow is the Font, and it’ll be open around four pm. We’ve set a ton of problems of literally all grades so come on in and finish those comp projects and try out all our new lines as well. Ok, so she's got the volume. Now how to get to the cone? Ok, so maybe try a heel up? Yes, it did work. Apparently she does yoga. A lot. 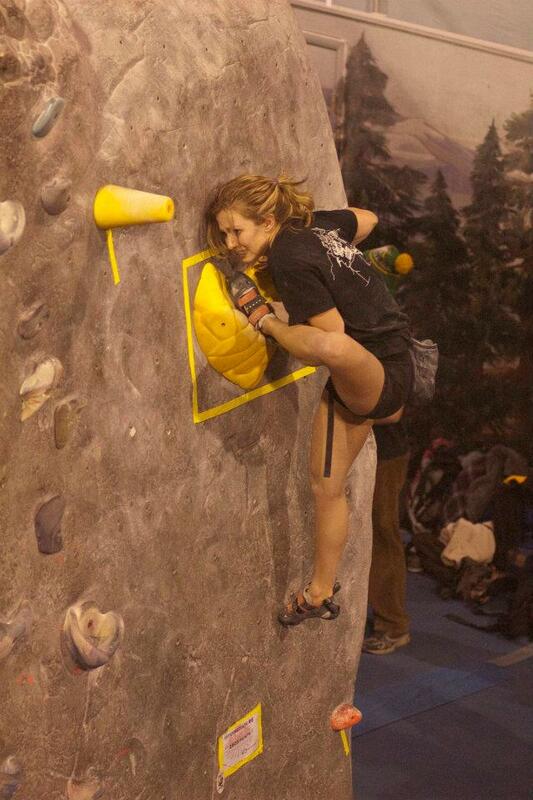 Nice job on finding an original solution to this boulder problem! Tonight we stripped the Dojo and the Beach. 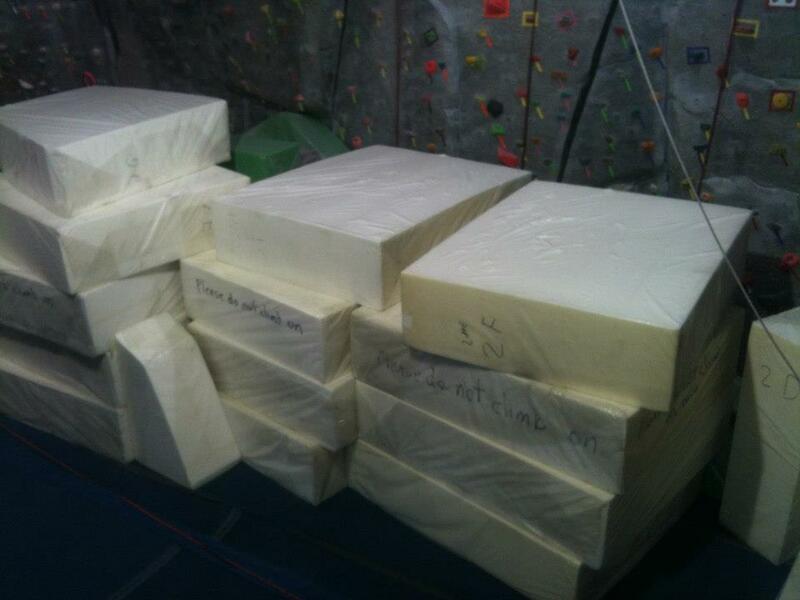 Tomorrow we’re setting ’em, but the rest of the gym is still open for your climbing pleasure. Tomorrow night around 9 we’re gonna start dropping walls, but as usual there should be some left to climb on until regular closing time at 11pm. Fun! Jon and Johnny are both unavailable for this comp, but luckily Donell is able to help us out. Get psyched! So how hard are the open finals gonna be? Let’s see…oh yeah…THE AIR CONDITIONING IS WORKING!!!!! Josh got it all fixed up and with regular maintenance (i.e. vacuuming all the cotton out of the filters) it has been cooling the gym down like never before. Seriously. It made a huge difference today when it was hot out, and if you have been suffering from this heat wave it’s definitely a place to find a little relief. Today we began resetting the Beach. 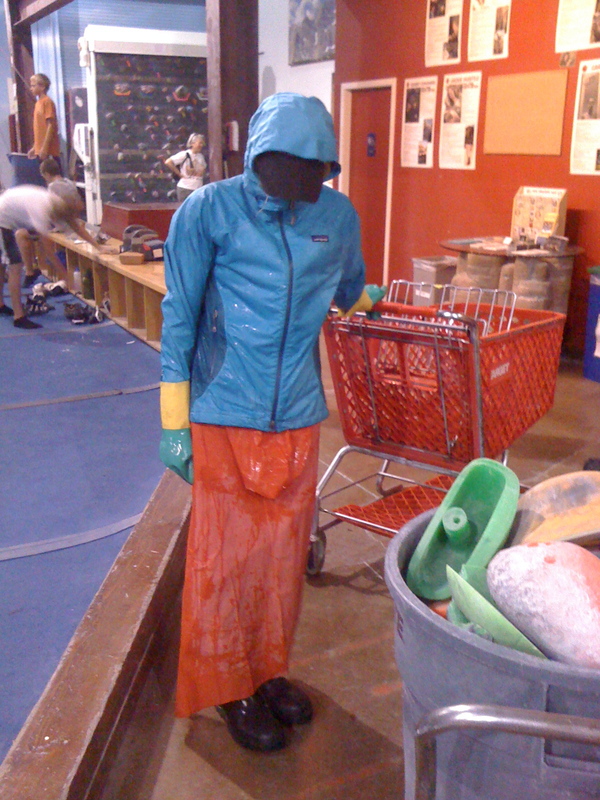 We stripped, cleaned tape, washed holds, and the large crew (Me, Jon, Jonny, Jay Jay, Danny, Garrett, Nic, Carlo and guest setter Connor Griffith) put up a bunch of problems including Garrett’s extra-super-amazingly-long-route-traverse-thingy. It is orange with a white stripe and blue chico and it starts on the left side of the beach and ends on the top of the far right. If you’re into traverses you’ll want to climb this one, especially because we probably won’t ever set a problem this long again. You can't really tell, but that's Jay Jay in there.